Finance isn’t just an industry. It’s a system of social control. From Populist denunciations of the “money trust” to Marxist theories of “finance capital,” left critics have often painted finance as a distinct social actor with its own set of interests. But in a forthcoming article, the economist JW Mason and his coauthors offer a radically different interpretation of finance’s role in capitalist society. In this wide-ranging conversation with Jacobin editor Seth Ackerman, Mason tackles the rise of index funds, the European financial crisis, and why we should take buzzwords like “disruption” seriously. “Financialization” has become a buzzword. Everybody seems to recognize that something like financialization is happening. They see it in their daily lives, they see it in the newspaper. But it’s hard to put a precise definition to it. In part, that’s what you try to do in this article. You and your coauthors define financialization as “a system for constraining the choices of other social actors.” What do you mean by that? The term financialization is used all over the place, but it’s usually defined in a pretty circular way: financialization means “more finance,” more things controlled by finance. Our way of thinking about it starts from the idea that the logic of the market doesn’t enforce itself — the logic of the market has to be enforced. And one way of looking at the role of finance is that it enforces the logic of the market and ensures that a whole range of decisions that could potentially be made in many different ways in fact end up being made according to the logic of commodities and of accumulation. Here we’ve been inspired by the economists Gérard Duménil and Dominique Lévy, among others. So, the most obvious case we highlight is the corporation. On one level, we think of the corporation as a typical organizational form of modern capitalism. But in another sense it’s simply a body of people with some sort of hierarchy and defined roles, engaged in some kind of productive process. It’s not inherently engaged in producing commodities for profit. And if we go back to the prehistory of the corporation, the corporation was just a legally chartered body that carried out some kind of function. It got appropriated as an organizational form for capitalism specifically, but it didn’t start out as that. The other side of the coin is that there’s a long tradition of thinkers, including Galbraith, Keynes, Veblen, and many others, who saw a natural, or at least possible, evolution of the corporation into the basis of some kind of planning or collective organization of production —that it could easily cease to be oriented toward the needs of profit maximization. So if you think that type of evolution is possible, then you ask, why hasn’t it happened? I would argue that the answer is that somebody stopped it from happening — that there are people in society whose job it is to prevent that from happening. There are people and institutions whose job it is to ensure that corporations remain within capitalist logic, that they remain oriented towards production for sale and for profit. On some level, this is the fundamental role of shareholders and their advocates, and of institutions like private equity. In some ways it’s even clearer when you look at finance in relation to states, because with states there’s no presumption that they should be guided by a logic of profitability or commodity production at all. So, the role of finance in enforcing a certain kind of policy on the state, a certain kind of logic, a certain kind of organization – whether it’s the bond market or whoever else we imagine here — is even more clear-cut. Which is how people usually try to define it. Right. For example, there’s an economist at NYU, Thomas Philippon, who’s a mainstream guy, and he had an article a few years ago that got a lot of attention. It was called “Has Finance Become Less Efficient?” He says there’s this funny thing where, if you try in various ways to measure the growth in the amount of actual financial intermediation activity going on in the economy, it doesn’t seem to have increased anywhere near in line with the increase in the scale of finance as an industry, in terms of its share of the economy’s output or income. So it appears that the “cost of intermediation” has actually gone up rather than down in recent decades. Which is strange, if you think of this as an industry that’s performing some useful function – it’s actually become less efficient during a period where it’s been growing rapidly. It invites the question: what is this sector actually for if it’s not just doing what it’s supposed to do, namely, allocating scarce resources for investment? The other thing we wanted to push against is the flip side of that notion, which is the idea of finance as a distinct social actor with a distinct set of interests – that we can talk about finance capital as if it had its own material interests distinct , or opposed to, industrial capital or capital in general. That just doesn’t seem to fit the sociology of the system we live under, where there’s obviously a lot of back and forth between these groups. In general, the wealth that takes the form of claims on productive enterprises also takes the form of financial assets. There’s not a distinct group of people or entities who you would call industrial capital as opposed to finance capital. Again, this functional view of finance, as the enforcement arm of the capitalist class as a whole, seems more productive. In other words, the way Philippon frames his analysis, it makes it seem like finance is just one industry among others, except that it’s an industry that’s experienced declining efficiency. So now we have to figure out why its efficiency is falling. But you’re saying, maybe in a larger sense it’s not actually experiencing declining efficiency. It may just be efficiently doing what it’s supposed to be doing. Exactly. I think that his results are interesting in a negative way, for setting the stage for different questions. In a way, your article is set up as a series of paradoxes or puzzles, and you explore how your approach can resolve or shed light on those paradoxes. One paradox you raise has to do with the role of the shareholder in US and UK capitalism. The notion that shareholders should have a voice in the management of corporations is based on the idea that they’ll wield their power to pressure firms to become more competitive, more successful at competition. And yet, you write: “Ironically, as financialization concentrates ownership claims in a few big funds, it may weaken the ideological basis for private ownership.” What do you mean by that? The big thing is that you’ve had the rise of index funds and other passive investment funds. There’s been a recognition among people — investors, smaller holders of financial wealth — that there isn’t a lot of value from all of these services that purport to offer some kind of superior investment strategy, and that the best option is to buy one of these index funds that just buys and holds some entire index of securities — whether it’s the S&P 500 or some other index of stocks — in proportion to their share of that index. Vanguard, the mutual fund company, was the pioneer there. Yeah, but it’s grown very rapidly and a lot of the big institutional investors have embraced it as well, not just small individual investors. And the result is that you get a very large fraction of corporations essentially owned in common by a few large funds. We cite a nice paper by José Azar where he reports that in 1999 less than 20 percent of firms in the S&P 1500 had a substantial shareholder in common, a shareholder that owned 5 percent of more of their stock. In other words, if you randomly picked any two publicly traded corporations, it was relatively unlikely — a one in five chance — that they had a large shareholder in common. By 2014, the proportion had reached 90 percent. In other words, almost every corporation shares large shareholders with other large corporations. So, it went from less than 20 percent to 90 percent in less than twenty years. Right. It’s not that there’s been a huge change in the distribution of the ultimate wealth owners, but the actual stocks are owned by a relatively small number of financial vehicles that then, in turn, are owned by a widely dispersed group of people. But as Azar and others have pointed out, from a shareholder-value perspective, that really changes the logic of profit maximization. If each firm has a different set of shareholders, “maximizing profits for the shareholders” is basically the same as “maximizing profits for the firm.” But when you have the same shareholders across all these different firms, those two objectives are quite different. The example that people like to talk about is the airline industry, because a lot of what the airlines do to compete with each other is to get more market share by offering lower prices than their competitors. That’s what capitalist businesses are supposed to do. That’s supposed to be a big part of how living standards and productivity are raised under capitalism: businesses try to undercut each other, offer lower prices, better quality, and steal customers from their competitors. But if they all have the same shareholders, then that behavior, from the shareholder’s point of view, is really counterproductive. Because basically, you’re putting money into the shareholders’ pockets from one of these airlines just by taking it out of their pockets from the other airline. If you’re a shareholder who owns all of the major airlines, you want them to just divvy up market share in a stable way. The last thing you want is to see them all competing and offering fare cuts that are just going to the customers and not to you. “Ruinous competition,” as they used to call it. Right — well, your “ruinous competition” is my “productivity-boosting culling of the herd.” It’s how capitalism is supposed to work. Businesses are supposed to be competing with each other. The only real argument for this system of production is that it encourages innovation and it encourages reorganization of production, because capitalists constantly have the threat of being undercut by their competitors if they don’t adopt the newest, best, most effective technologies and if they don’t embrace new products and new processes. They’re going to get left behind. If you take competition out of the mix, it’s unclear what function private ownership is supposed to accomplish. If the evolution of finance gets you to a situation where you have a single set of institutions — or in the long run, maybe a single institution — that owns all of these firms, then pressure from shareholders is going to be against competition. They don’t want to see these firms trying to gain market share or anything else at each other’s expense. It’s hard to listen to what you just said without thinking of the debates that took place in the late nineteenth and early twentieth centuries, where many people — arguably including Marx — predicted either that firms would be consolidated into the hand of a very small number of controllers or that the underlying wealth would be concentrated into the hands of fewer and fewer people. And in either case, it would undermine the basic logic that made capitalism an economically and politically successful system in the first place. Yeah, I think it’s very reminiscent — although there’s also a sort of dialectic here. At a certain point in time, you had stable oligopolies with a few large producers that weren’t aggressively competing with each other. So you generated a surplus, some of which was retained and maybe used for white elephant investment, and a fair amount was shared with workers who had an easier time unionizing in a setting of stable oligopolies. That was very consciously disrupted starting in the ‘70s and ‘80s. There was an effort to force these firms to behave differently, carried out largely, though not only, through finance. But then a generation later, you get the same objective outcome, but now achieved through finance: maybe more notionally competing firms, but at the ownership level there are only a handful. Now, whether that then creates a pot of surplus that becomes politically accessible is up to us. But there’s a sense in which the weapon that was supposed to stave off a self-socialization of capital then tends to socialize itself. And yet, when you look around the world today, you get at least the impressionistic sense that people and firms are under more and more pressure to produce and perform compared to the ’50s or the ’60s. It certainly looks like the social fabric of an economy with a lot of intense competition. To some extent the same results of competition can be produced through other means. In some ways, again, what finance is intended to do vis-a-vis other corporations, is create the pressures of competition without actual competition. If you have the possibility of removing management if it fails to achieve some target, if you have the threat of a change of control, which creates that same atmosphere even in the absence of competition. To a certain extent, that’s what finance is for. Even some of the people who advocate for a greater corporate role for shareholders and financial claims would say that’s the goal. If competition isn’t producing that sense of insecurity, that sense of fear, among the people running the business, you need to artificially simulate it. Maybe it’s both. It could be that concentration produces less competition for a few powerful firms and more competition for all the other firms. Think of all the industries affected by Facebook or Google, for example: everybody feels like they’re under constantly escalating competitive pressure — not from direct competitors, but just from those two big firms. Yeah. Or you could talk about suppliers for Walmart. The centralization in retail and the power of Walmart creates an intensification of competition for the upstream parts of their supply chain. Another paradox you talk about has to do with the European response to the financial crisis. In the 2000s, financial markets lent lots of money to peripheral European governments at low interest rates, and after the crisis broke out, those governments ended up on the verge of default. The general view among European policymakers was that the crisis had been caused by financial markets mispricing the risk of government debt — in other words, lending too much on easy terms. Yet you point out that their policy response was to try to intensify financial market governance of public debt. Yeah, this one is so clear cut. It’s puzzling to me that people are able to maintain this level of cognitive dissonance. The standard analysis was that before the crisis, investors thought that now that you had the euro, Greek, Italian, and Spanish government debt were all just as safe as German government debt, and so you had this convergence of interest rates. It became very easy for governments in the periphery to borrow to excess with abandon, and that created the conditions for the crisis. It boggles the mind because these people say that the wonderful thing about these open capital markets is they create discipline for governments: they create a condition where governments don’t have a captive central bank that will guarantee that their debts get funded, so they have to convince private investors that their programs are viable. Obviously, this language is absolutely ubiquitous. But the very same people who say that will then say that the source of this crisis is that markets were mispricing these government debts, that it was precisely the failure of these markets to provide this discipline that created this terrible crisis. I’m honestly baffled how people manage to reconcile those two views, but they do. The German position on this has been interesting, because a core element of their reform policy to prevent future crises was to try to force government bondholders to take losses instead of bailing them out. On the surface, that seems like an antifinance move. But their actual argument was that if we keep shielding bondholders from losses, then they won’t be able to impose the market discipline they’re supposed to be imposing. Yeah, that really brings out the distinction between finance as a distinct social actor with its own interests versus finance as an institution whose function is to maintain market discipline where it might otherwise not exist. Because you’re right, from the point of view of finance as a social actor, imposing losses is a bad thing. But from the point of view of maintaining the effectiveness of finance as a disciplining device on states, it makes a lot of sense. As a counterpoint to Europe, your article uses India as an example of a place where things have played out quite differently. Could you explain how India is different and why? The interesting thing is that for some time now in India, you’ve had governments that, on paper, in their public pronouncements, are very committed to liberalization. They’re very self-consciously neoliberal governments that want to roll back the kind of public management of the economy that existed in the first decades of independence. They really want to extend the role of markets, they want privatization and so on. And then if you look at what’s actually happened, particularly in finance, it’s much less dramatic. Most of the banking system remains nationalized. You don’t have the development of financial markets in the way you’ve had in the US. You certainly don’t have ability of shareholders to exert control over nonfinancial companies the way you do here. You don’t have the wholesale shift of corporate financing away from banks and toward financial markets. That’s been one of the real key pieces of financialization in the US and elsewhere. It’s sort of funny. Despite the fact that for a long time they’ve had governments that are very convinced that liberalization is the right thing to do, they haven’t gone very far with it. What we suggest is that the notion that finance enforces a market logic on productive activity runs both ways. On the one hand, if you get a lot of finance, you will get this greater adherence to the logic of commodity production, the logic of accumulation. But on the other hand, if you have other overriding social goals as a state that really prohibit that, then you actually won’t be able to carry financialization very far. And the legitimacy of the Indian state depends on a fair amount of redistribution. It depends on rapid economic growth, to which financialization and market logic are not actually very friendly. You need stable conditions for financing investment, which corporations don’t get when they’re extremely responsive to shareholders. And the authorities realize that, even if in all their rhetoric they seem to deny it. Right. Whether they realize it consciously, I don’t have the slightest idea. But in practice, the way these things develop is you encounter problems, you encounter resistance and, depending on the relative strength of your commitment, you push through that resistance or you back off. Because for various reasons, the Indian state is fairly committed to a program of development and a program of some degree of redistribution. And they’ve been sort of forced, under the pressure of events, to back off from a program of liberalizing finance that, ideologically, they would like to pursue. Underlying these individual paradoxes is a sort of metaparadox, or at least a deep tension between two different roles finance plays. On the one hand, finance plays the role of relaxing market discipline, in the sense that it lets people spend more than their existing income or wealth by letting them raise money on the financial markets. And yet, in the conventional story, finance is also supposed to play a beneficial role by imposing discipline on the spendthrift. That’s right. You could say that mainstream economic theory avoids this paradox by assuming this infinitely liquid world in which we can all access our income at any future date to spend today. But in the real world, the constraint the market imposes on you is that you can’t spend more today than the money available to you today. Which, in the most extreme form, means that the income you’ve collected in the past is the hard limit on how much you can spend today. That’s the ultimate form of market discipline and, in that sense, the whole function of finance is to remove that discipline — to allow spending today based on future income that hasn’t yet been received, and may not be received. In a fundamental sense, the reason we have finance is to allow money-losing enterprises to operate. The money-losing enterprises are the ones whose current activities don’t fully pay for themselves, which is why they need to raise finances in the first place. That’s what it means, in a cash-flow sense, to be carrying out investment: you’re carrying out activities which, in the current period, don’t pay for themselves. You believe, you hope, that they will pay for themselves in the future, but at the moment they don’t. The purpose of finance is to allow that to happen, to allow people’s beliefs and hopes about the future to take precedence over the actual results that have been achieved in the present. But then, on the other hand, the judgment of finance is supposed to be enforcing market discipline, even on actors who otherwise might not be subject to it — like states, and, potentially, large corporations whose existing profits are already more than they need to maintain themselves and achieve their desired level of growth. You can find this tension in how people talk about finance going all the way back to the beginning. If you look at David Hume’s Essay on Money, initially he says the whole business of banking is pretty suspect for exactly this reason: banks create these paper claims that aren’t necessarily tied to any real productive activity, so the best banks would be the ones that just operated as safe deposit boxes. If they just accepted people’s coins and never made any loans at all, that would be the best. Anything else is just creating this fictitious capital that’s going to displace real, legitimate market activity. But then later he goes back to the same question and talks about how wonderful these new banks in Scotland are, and how they’re allowing people to essentially get lines of credit based on any kind of wealth. As he says, a merchant can now “coin his entire house.” His house, his furniture, his goods in the warehouse, can all function as coinage. Right, but in his phrase he can “coin” them. In other words, they’re as good as money. They can serve as collateral because you can undertake short term borrowing against them which you can then use for payment to other people. All these material goods become just as good as money. People always have these two logically inconsistent, but often simultaneously held, ideas about what’s wrong with the money system — that it’s too tight in terms of how closely it links current expenditure to current income, but then also that it’s excessively loose and fosters speculation, which just means using your beliefs about the future as a basis of activity today. This isn’t just a confusion, it’s a really profound sort of paradox concerning what credit and finance actually do. 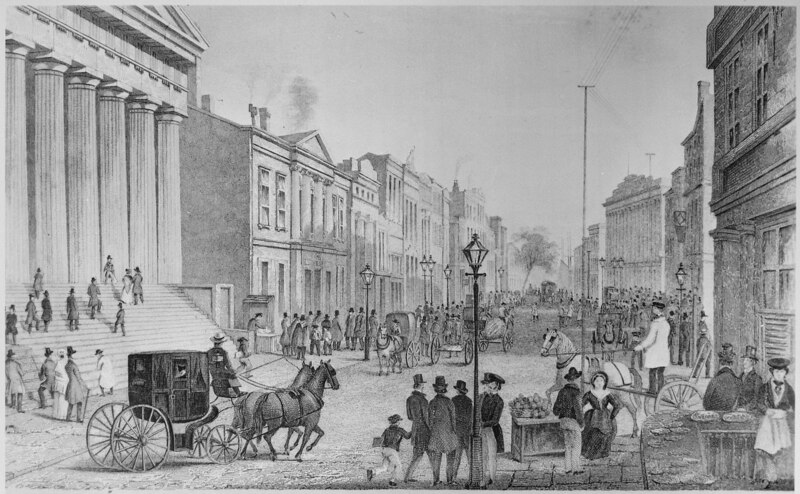 That same confusion was at the heart of the whole banking controversy in the Jacksonian era. Andrew Jackson and the Jacksonian opponents of the Bank of the United States were never quite sure whether they were upset that it was too tight with money or too loose with money. Absolutely. I was just reading about this, and those debates are absolutely fascinating because you get the Bank of the United States being opposed by these people who are speculating and making land loans, people who just wanted to have complete open season, let anyone start a bank. And then it’s also opposed by other people who just don’t believe in banking at all, and think that everything should be cash on the barrelhead, immediate payment in hard money or goods. But both groups hate the Bank of the United States. In a way, the whole history of monetary and financial reform is one of trying to come up with some formula to square this circle, whether it’s the real bills doctrine or the gold standard or the Taylor rule. We started by talking about how “financialization” has been used as a buzzword without a very convincing definition. The same has been claimed about the word “neoliberalism.” There’s been a lot of debate about whether the word neoliberalism means anything — does it actually refer to anything in the world or is it just an empty epithet with which to bash other people over the head? What do you think the relationship is between financialization, as you conceive of it, and this apparent thing or non-thing called neoliberalism? Well, I’m not very sympathetic to people who say the term neoliberalism doesn’t mean anything. First of all, there are people who self-identify or have self-identified as neoliberals and put it forward as a conscious program. But sometimes the issue is that if you can’t conceive of social life organized in any terms except commodities, if you can’t conceive of any right that isn’t a property right, if you can’t conceive of any sort of goal or organizing principle of collective productive activity except maximizing profit or some kind of stand-in for profit, then the term neoliberalism isn’t going to make much sense to you. Because the extension of market logic can’t be parsed by someone with a worldview where everything is already organized as markets or might as well be. I suppose you could say that neoliberalism is broader than financialization in the sense that the growth of finance is about enforcement of market logic on other domains of human activity. But it’s not the only instrument for that. You can imagine and you can point to other methods of enforcing that logic that don’t really consist of anything you would call financial institutions or the development of financial markets or anything like that. That’s what I was thinking of while reading your article. Once financialization succeeds, once you accept that there will be greater financial discipline to ensure that all domains of society are following the logic of markets and profit maximization, it will create a whole series of disruptions in society. Every type of institution, even nonmarket institutions, will have to adjust to it. People are going to have to adjust their lives, even at an intimate scale. So maybe “neoliberalism,” in part, refers to the ensemble of those responses and adjustments. Yeah, I’m glad you used that word “disruption,” because that’s a buzzword we should take seriously. The normal evolution of things, in economic life, is that a pattern of production gets established — with its set of responsibilities, its set of claims by various participants — and these take on moral force and become familiar, at which point they don’t need market mediation anymore. People become accustomed to working together, they become accustomed to exercising certain claims and having them honored. So the people who work at a business for a long time can continue operating that business even without the spur of the market. They’ve got the knowledge, habits, relationships, and a personal investment in it. And then someone comes in and says we are going to break up all of these relationships, we are going to treat what people had come to regard as moral claims as purely contractual arrangements, we are going to more or less coercively tell people to engage in a completely different set of activities. From the point of view of somebody who’s actually living in a particular set of relationships, who is living in a particular kind of activity, disruption is very disruptive. It’s a bad thing. It’s costly. It’s frightening, and it’s not something people are going to choose to subject themselves to if they have a choice. When people in finance say they are engaged in disruption, I think they’re right. That’s something that we should be giving them credit for. And then we should be saying we don’t need so much disruption. Of course people don’t like being disrupted. But they live in a world where there is constant disruption. And people have to do their best in that world. They have to adjust and make changes in their arrangements and outlook and behavior. And if you look at the ills of the world today, the results might not be very pleasant. That’s right. Finance, in a certain sense, is there to keep people from becoming too comfortable, too secure. But, as you say, when you take away people’s comfort and security, you may not like the reaction you get. J. W. Mason is an assistant professor of economics at John Jay College, City University of New York and a fellow at the Roosevelt Institute. He blogs at The Slack Wire .